For ten years, F&F Painting Company LLC has been providing interior painting for homeowners and businesses across CT. Whether you are looking to finish a new addition to your property or have a change of style, we can help. We pride ourselves on our time-tested process, ensuring a quality finish every time. Fine preparation of all of walls and ceiling using spotlights to find imperfections. Light spacing and floating at large voids where trims meet drywall to insure clean straight lines. Fill all nails, holes and joints with either wood filler and/or bondo for all casings, crowns, baseboards, wainscoting, speciality trims and cabinetry as specified. Sand all trims, cabinetry and millwork with sandpaper. Application of one coat of Ben Moore Oil Enamel Underbody to all trims, cabinetry and millwork. Full cleaning of all areas to remove dust form area before commencing finish coats. All trims, cabinetry and millwork will be wiped down with denatured alcohol, helping to remove all surface dust the day finish coats start. Sanding and correction of any imperfections that may have been missed between coats. Protection of all finished surfaces prior to work commencing. This includes papering of all floors, taping of all windows, covering of all tiles and stone surfaces, covering of all finished millwork, protection of all decorative hardware and plumbing fixtures, etc. Daily clean up and removals of all debris. 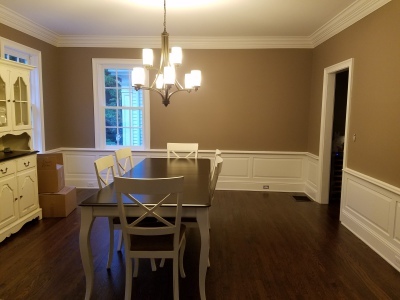 Our painting contractors are among the best in Connecticut! We use only quality name brands and offer very competitive rates for our experienced craftsmanship. F&F is fully licensed and insured, we can supply you with references from satisfied homeowners.